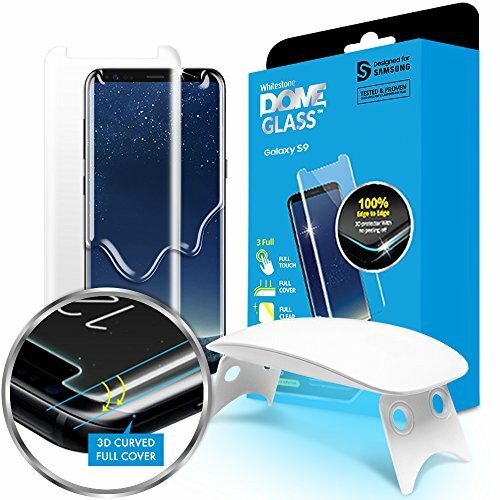 Touted as one of the best tempered glass protectors, our patented Dome Glass has the maximum strength and scratch resistance rating of 9H (hardness measurement). Compared to cheap $10 alternatives, this ultra strong glass will not fade or fog with extended use and fully covers your Galaxy S9 (not compatible with S9+ model) from edge to edge. Our revolutionary liquid glass adhesive forms around the edges of your curved screen to create a single, solid layer of anti-shatter glass. Cell phones have become an essential part of our lives. However, one of the negative effects of smartphones is their emittance of shorter wavelengths called Blue Light. Studies suggest that, over time, exposure to blue light, especially harmful at night, can cause serious long-term damage to your eyes. Our White stone Dome Glass decreases the strength of blue light by up to 25%--protecting you and your smart device!